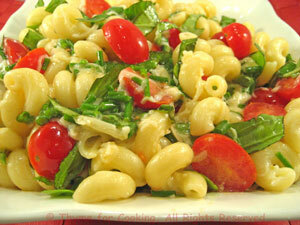 Pasta with Cherry Tomatoes and Basil, Thyme for Cooking easy spring side dish. Cherry tomatoes and lots of fresh herbs make this a bright pasta side dish for summer. The heat from the pasta will melt the cheese slightly. When pasta is done, immediately put into a large bowl, add olive oil, tomatoes, cheese and herbs.